Because wearing thick wool socks at home should be a choice and not a necessity. Are cold floors and freezing pipes on the agenda every year when it turns cold? Poor or no insulation in your crawl space allows the cold outside air to leak through, causing a variety of problems during the cold Michigan winters. 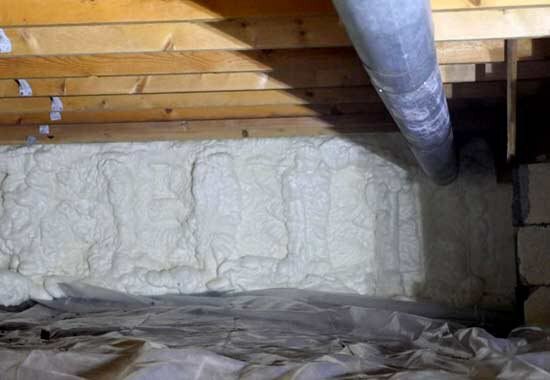 Replacing your old crawl space insulation with spray foam creates an air seal to keep the cold air out - preventing pipes from freezing and reducing your family’s complaints of cold floors. Foam insulation provides the necessary air seal to prevent cold floors, air leaks, and drafts coming from your foundation area making your home uncomfortable. Spray foam fills all the nooks and crannies in the crawl space to provide an air seal around the foundation, keeping the cold outside air away from pipes. Preventing air leaks in the crawl space improves your home’s energy efficiency, reduces the carbon footprint, and saves on monthly energy bills. The crawl space installation process is quick and easy for homeowners ready to cross off cold floors and frozen pipes from their yearly occurrences. 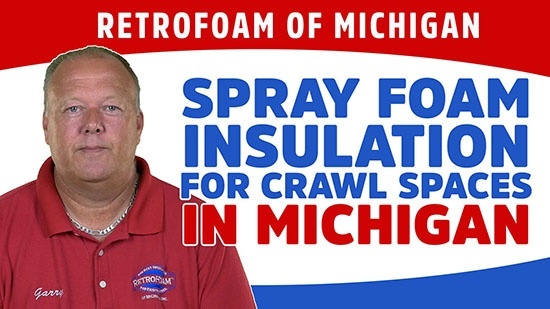 We’ve successfully insulated crawl spaces in new and existing homes for more than 15 years across Michigan’s lower peninsula. Our consultative estimators, highly skilled crews, and helpful office staff have a mission to guide you through the whole process with ease. Our work also comes standard with a lifetime warranty. For the spray foam to do its job properly, the old fiberglass insulation will need to be removed. Our removal crew will roll up the old fiberglass, placing it in large bags, and then dispose of it. It’s a dirty job, but our removal crews are experts at getting the space nice and ready for the spray foam insulation installation. If there is ductwork and mechanicals present in the crawl space, we recommend laying plastic down on the ground and then spraying the crawl space walls as well as the rim joist. Doing this will seal off the foundation of your home, allowing the crawl space to be around the same temperature as the rest of the home. An added bonus of this installation method is that the heat from the mechanicals in the crawl space will move freely through the floors, adding even more comfort. If there is no mechanicals or ductwork present in the crawl space, crews would instead spray the crawl space ceiling to air seal the crawl space completely from the rest of the home. 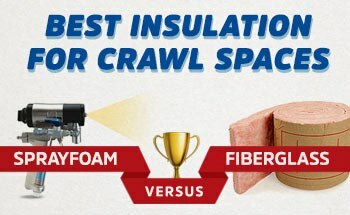 Want to compare all insulation options for the crawl space? Learn about the pros and cons of the most common insulation materials for crawl spaces including fiberglass and spray foam. Curious about the price of crawl space insulation? Learn about the factors that impact the pricing of foam insulation, as well as what you might expect to pay for your project. Problems caused by poor crawl space insulation can cause cold floors and freezing pipes. 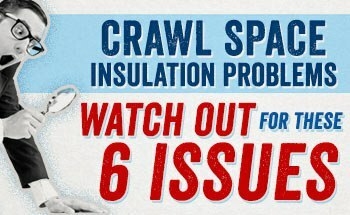 Learn what the common problems are and how to avoid them with the right crawl space insulation. Will spray foam help with cold floors? Yes, it can, so you won’t need those socks or slippers anymore. Spray foam creates an air seal that will keep that cold crawl space air from coming up through the floors. Learn more. If you’re concerned about moisture control, then yes. That’s because moisture can seep into your crawl space through the soil. Learn more. What’s the difference between crawl space encapsulation and insulation? Crawl space insulation focuses on comfort issues stemming from the crawl space, while encapsulation focuses more on moisture issues. Learn more. Will insulating the crawl space with spray foam help with frozen pipes? Yes. The pipes in your home should be included in your building envelope. Spray foam in the crawl space can do this and helps reduce the chances of frozen pipes. Take the first step towards more comfortable floors in your home.